Many top companies today are providing employees with mobile apps to improve how they do their jobs. 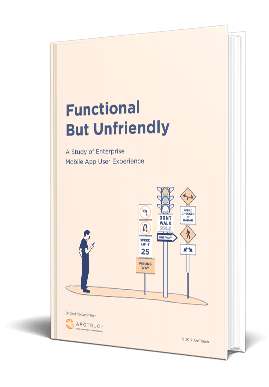 But many times, those company-issued apps fail when it comes to delivering the type of great user experience we’re used to with the apps we download from the public app stores. In this quantitative study, ArcTouch surveys office workers to understand how apps in the workplace perform when it comes to user experience, and where they fall short. Learn what types of apps are most useful and how off-the-shelf apps and custom apps perform in the hands of users. Understand what app attributes are important for office workers and how performance on many apps fails to match that expectation. Find out the correlation between specific key attributes and how performance of those attributes can drive overall user satisfaction.